In this twist on Greek mythology, Percy Jackson discovers that he is a demigod, son of Poseidon and a human mother. This fact has been hidden from him for the past twelve years, but once Percy finds out, it explains a lot. He's dyslexic because his brain is hardwired for ancient Greek, not modern English. The monster he slayed on his school's last field trip wasn't a figment of his imagination. And his best friend Grover walks funny because he's actually a satyr with goat legs stuffed into human shoes. Whew. Once the secret's out, Percy finds himself at Camp Half-Blood, a training ground for heroes like himself. Unfortunately, his mom disappeared in the struggle that led him to the camp. When Percy is offered a quest, to retrieve Zeus's lightning bolt and prevent a massive war between the gods, he finds his chance to rescue his mom. Along with pals Grover and Annabeth (daughter of Athena and a mortal man), Percy sets off to find the Underworld (located in L.A., where else?) and complete his quest. Along the way he runs into Medusa, Echidna, and a host of other mythological characters, all updated for the modern age. This is a laugh-out-loud adventure fantasy and will appeal to fans of Harry Potter and Peter and the Starcatchers. I read it several years ago, but decided to reread it because I couldn't remember it enough to booktalk it. I liked it the first time I read it, but I loved it even more this time around. Percy Jackson is this kind of punk kid hero who won't take anybody's crap. He cares about his friends and about doing what's right, but he's also got a little bit of a chip on his shoulder. As the book goes on, he starts to deal with his issues and figure out who he is. This one will be an easy sell for the Caudills, I think. Who doesn't love Greek myths? And if anyone didn't love Greek myths before they read this book, they'll certainly want to check some out after reading it. 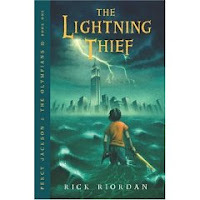 The Lightning Thief is the first in the Percy Jackson and the Olympians series. It's followed by The Sea of Monsters, The Titan's Curse, and The Battle of the Labyrinth (coming in May).